Only at Best Buy 60W peak power handling; 4" polypropylene woofer cone; 1/2" Mylar tweeter. 4" polypropylene woofer cone and 1/2" Mylar tweeter. Insignia2-Way Indoor/Outdoor Speakers (Pair). Number Of Speakers: 0. 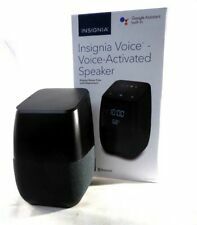 Insignia™ - Voice™ Smart Bluetooth Speaker and Alarm Clock with Google Assistant - Black. Item does include User Manual. We will help to. resolve any issues quickly and fairly. We stand for excellent quality, savings, and service. Once removed it will void your warranty. All of our products will have a unique hollow-gram warranty sticker. Fraud Prevention! INSIGNIA- 2-WAY INDOOR/OUTDOOR SPEAKERS (PAIR) - BLACK. 4" polypropylene woofer cone and 1/2" Mylar tweeter. Insignia2-Way Indoor/Outdoor Speakers (Pair). Owner's manual. Allow simple installation. We sure appreciate the opportunity to serve you. Inputs: RCA stereo, analog audio and optical digital audio. Input: 3.5mm audio, Optical Digital Audio, RCA, Subwoofer. Remote:Enables simple operation from a distance. Frequency response: 150Hz - 15kHz. Insignia NS-SB316 Soundbar with Bluetooth and Digital Amplifier OPENED BOX. OPEN BOX. Item is NEW. TESTED, WORKS PERFECT. -Box shows signs of Shelf Wear. 4.5 out of 5 stars - Insignia NS-SB316 Soundbar with Bluetooth and Digital Amplifier OPENED BOX. 91 product ratings91 product ratings - Insignia NS-SB316 Soundbar with Bluetooth and Digital Amplifier OPENED BOX. With the touch of a few buttons, you're ready to enjoy multiroom music. Google Assistant built-in. Works with Wink, Nest,Google Assistant, Hue, Ring, SmartThings, and More! Multiroom compatible portable speaker. INCLUDES SOUNDBAR, AND POWER CORD ONLY. Universal compatibility with any Bluetooth enabled device. Requires power from a wall outlet. Our main warehouse is located right outside of Baltimore, Maryland. Phone Cases. Phone Batteries. INSIGNIA- 2-WAY INDOOR/OUTDOOR SPEAKERS (PAIR) - BLACK. Insignia 2-Way Indoor/Outdoor Speakers (Pair). 4" polypropylene woofer cone and 1/2" Mylar tweeter. Number Of Speakers: 2. Indoor Or Outdoor Use: Indoor and outdoor. Up for sale is a pair of Insignia NS-B2111 Carbon Fiber 2 Way Passive Shelf Speakers with Filters Hi Fi. Soundbar Type: Powered. Bluetooth Enabled: Yes. InputsIncludes RCA stereo, analog audio and optical digital audio. Input(s): RCA|Subwoofer|3.5mm audio|Optical Digital Audio. RemoteEnables simple operation from a distance. INSIGNIA NS-SB316 2.0 CH SOUNDBAR ONLY! Fully tested and works great. Trending at $31.82eBay determines this price through a machine learned model of the product's sale prices within the last 90 days. ▪️Weather resistant construction for indoor / outdoor use. ▪️40 watts per channel handling capacity. ▪️Pair of multi-purpose 3-way surround sound speakers. ▪️90 Hz - 20 kHz frequency response. Insignia - Soundbar with 39-Watt Digital Amplifier - Black - Preowned. 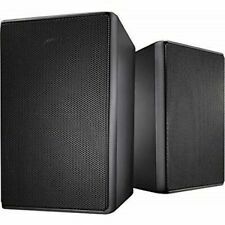 Insignia NS-B2111 2 Way Bookshelf Speakers In Great Condition Black . There is gouge on a cabinet as per picture These speakers are a great sounding speakers The design incorporates the tweeter driver within the woofer driver for 2 way high and low sound Speakers are from a smoke free home Specs Crossover Channel Qty 2-way Audio System Max Output Power 120 Watt Frequency Response 50 - 20000 Hz Nominal Impedance 8 Ohm Sensitivity 90 dB Width 8.6 in Depth 12.1 in Height 13.4 in. Insignia - Voice Smart Bluetooth Speaker - Black. Alarm Clock with Google Assistant. Voice Assistant Built-in - Google Assistant. Works With - Google Assistant, Hue, Nest, Ring, SmartThings, Wink. The speaker features a digital LED clock & Temperature display and has a built in alarm clock. Insignia Voice Smart Bluetooth Speaker with Google Assistant - Black (NS-CSPGAS…. Condition is New. Shipped with USPS Priority Mail. 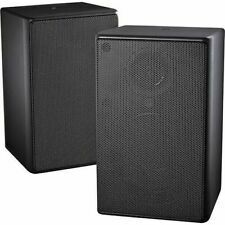 Open-Box Excellent: Insignia- 2-Way Indoor/Outdoor Speakers (Pair) - Black. Condition is New. Shipped with USPS Priority Mail. Purchased thinking was wireless but realized when opened box they were wired speakers. No attempt to install or take out of packaging, brand new purchased from Best Buy. Insignia 3 Way Indoor Outdoor Speakers 40 Watts IS-SP3WAY Condition is New. Remote: Enables simple operation from a distance. (Remote, optical digital cable and power adapter included) can be hanged from wall. Inputs: RCA stereo, analog audio and optical digital audio. Input: 3.5mm audio, Optical Digital Audio, RCA, Subwoofer. Insignia™ - Voice™ Smart Bluetooth Speaker and Alarm Clock NS-CSPGASP . Condition is Used but in great condition. Free from any scratches, dents or marks. Contact me with any questions. Item must be paid for immediately upon auction end. Item ships next business day. Happy bidding! The cloth protective cover has a few holes in it. Slight deviations may occur. Therefore. Universal compatibility with any Bluetooth enabled device. Requires power from a wall outlet. Silver & Supplies Central. Best Quality. All Catalog. Browse our. Cell Phones Batteries. Cases & Covers. No other accessories included. We utilize warehouses across the Continental United States. We stand for excellent quality, savings, and service. All of our products will have a unique hollow-gram warranty sticker. U p for sale - Insignia NS-SB316 31" Soundbar with 39-Watt Digital Amplifier - Black. Insignia NS-SB316 - sound bar - wireless. Only listed above N O Remote and user's Guide. Inputs: Includes RCA stereo, analog audio and optical digital audio. One 2" polycarbonate cone. one 4" polypropylene cone woofer and. these 3-way indoor/outdoor speakers are designed to. Up to 40 watt RMS (continuous) power. Weather-resistant design for versatile use inside or outside. Google Assistant. Voice Assistant Built-in. Google Assistant, Hue, Nest, Ring, SmartThings, Wink. Bluetooth, Wi-Fi. Google Play Music, Pandora, Spotify, TuneIn, YouTube, iHeartRadio. Speaker Type. Headphone Jack. INSIGNIA- VOICESMART BLUETOOTH SPEAKER AND ALARM CLOCK WITH GOOGLE ASSISTANT - BLACKNS-CSPGASP-B. With the touch of a few buttons, you're ready to enjoy multi-room music. Built-in Google Assistant. Bluetooth and Wi-Fi capability for pairing wireless devices.